R2AK – Our Favorite Kind of Crazy - Global Diving & Salvage, Inc. 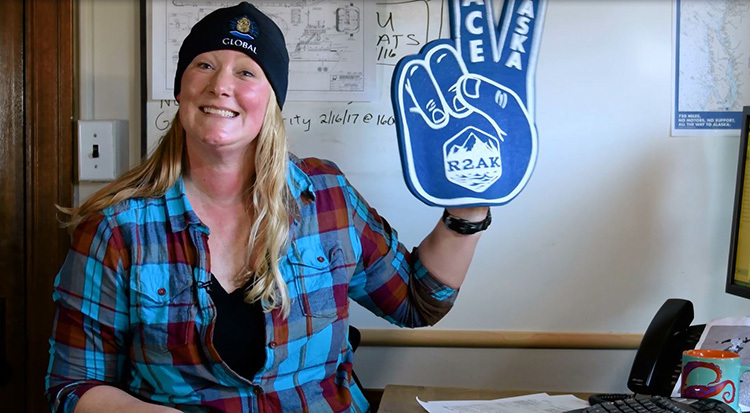 Sailing 750 miles from Washington to Alaska with no motor and no support in frigid waters and all kinds of weather is probably not on your bucket list, but the organizers and participants in the Race to Alaska (R2AK) aren’t your typical fair-weather seafarers. It takes a special kind of crazy to be part of a race like this – our kind of crazy – which is why Global decided to become a proud sponsor of the 2017 R2AK. At Global we believe fast thinking, grit and determination are major assets, and we pride ourselves on our ability to meet any challenge head-on and have fun doing it. It’s these personality traits we look for in our employees, so it should be no surprise that we have two employees participating in the race this year. Team Global is lead by Katy Stewart, our Marine Casualty Project Coordinator. Katy raced last year as captain of Team Onism, placing 17th overall. This year Katy has two new team members, a new wind, oar and pedal-powered vessel, plus a renewed determination to win the $10,000 grand prize. Malachi Church, a Global Environmental Technician, is participating in R2AK as a member of Team North2Alaska. This team didn’t think the race itself was enough of a challenge, so they doubled down and decided to fabricate their own aluminum vessel for the race. Check out Team Global’s latest video to learn a little more about Katy, Global, and why a little bit of crazy makes us better at what we do. And keep an eye out for more updates on Team Global, Team North2Alaska, and R2AK on our Facebook and LinkedIn pages.